Fashion city with numerous airways from city to city. Opened a blocked tunnel on the third island! There are even roads to the fourth city of the ghost and a platform under it, so you can stroll along it! Sin can not download - only 20 KB! 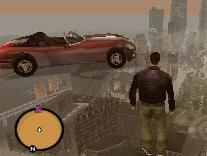 Jake_Hudson , Tunnel on the 3rd island leads to a ghost town to the city where "Liberty city bank" is located. First, roller games show this.